Windy City Ski and Snowboard Show - Annual ski and snowboarding show (typically held in Schaumburg in October), which has a ski swap, 100,000 sq.ft of Retailers, Resorts, Clubs, and Manufacturer Reps. In addition to all this, as part of your reasonable admission fee, you get vouchers for a couple of local ski places. Here are the vouchers that came with the 2014 show admission. Annual ski and snowboarding show (typically held in Schaumburg in October), which has a ski swap, 100,000 sq.ft of Retailers, Resorts, Clubs, and Manufacturer Reps. In addition to all this, as part of your reasonable admission fee, you get vouchers for a couple of local ski places. Here are the vouchers that came with the 2014 show admission. Warren Miller Annual Ski Movie - Warren Miller Entertainment produced one new ski movie each year. This movie then has an accompanying tour, which normally comes through Chicago around Oct/Nov. In addition to being a nice way to welcome in the ski season, everyone who comes to the showing gets a voucher for a bunch of free or discounted lift ticket tickets. 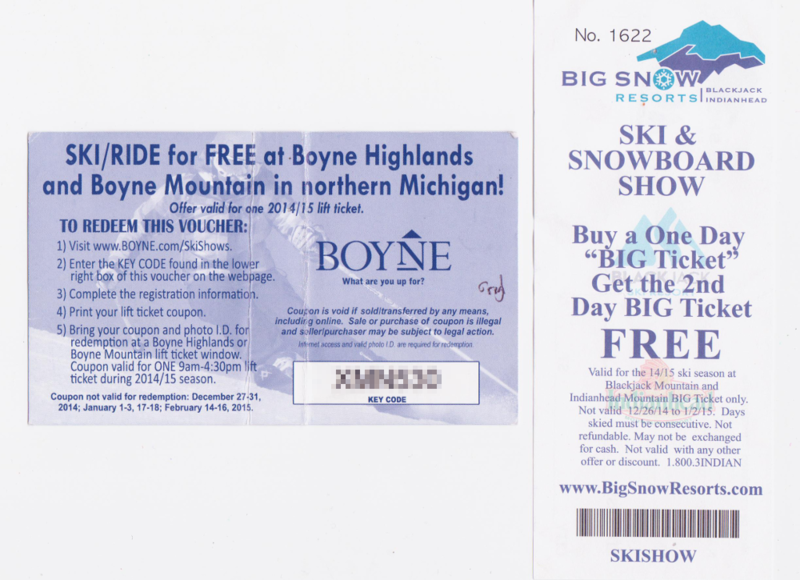 Here you can see the voucher given at the Chicago Show for 2014-2015 ski season. Warren Miller Entertainment produced one new ski movie each year. This movie then has an accompanying tour, which normally comes through Chicago around Oct/Nov. In addition to being a nice way to welcome in the ski season, everyone who comes to the showing gets a voucher for a bunch of free or discounted lift ticket tickets. 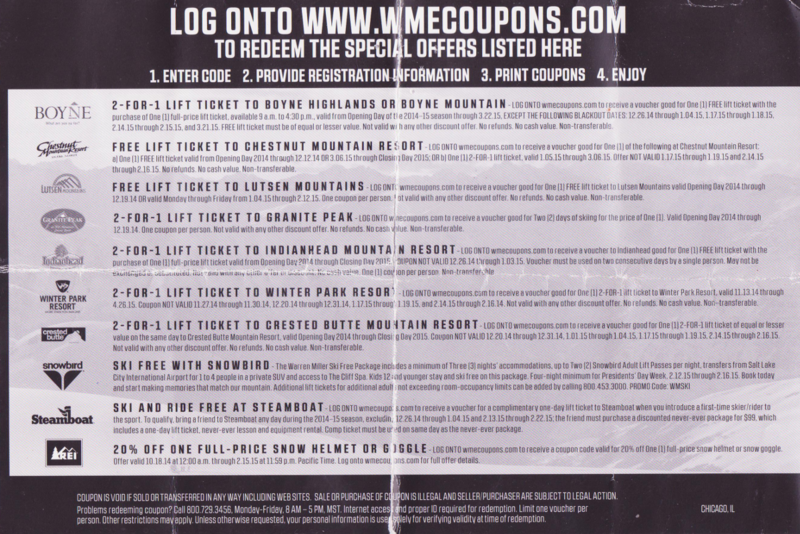 Here you can see the voucher given at the Chicago Show for 2014-2015 ski season. Shell Gas Station Ski Free Deals - participating shell gas stations offer ski free deals (most are BOGO - buy one get one free) with at least 10 gallon purchases at certain times. Country is broken into regions for coupons. participating shell gas stations offer ski free deals (most are BOGO - buy one get one free) with at least 10 gallon purchases at certain times. Country is broken into regions for coupons. Cascade Mountain kids (up to 12) ski free with paid adult - Cascade Mountain (Baraboo WI, about 3 hours northwest of chicago) allows kids 12 and under to ski free with a paid adult. big savings if you child or children are older than 5 (usual cutoff for free skiing) and under 13. Cascade Mountain (Baraboo WI, about 3 hours northwest of chicago) allows kids 12 and under to ski free with a paid adult. big savings if you child or children are older than 5 (usual cutoff for free skiing) and under 13. Granite Peak Family Festival Weekends - a few weekends a year, Granite Peak (formerly rib mountain) offers up special packages for families. a few weekends a year, Granite Peak (formerly rib mountain) offers up special packages for families. Copper Mountain Four Pack - 4 days of skiing (no blackout dates) in one of Colorado's big front range resorts for $149 (plus alot of other benefits like discounted friends tickets), what's the catch? You have to buy the tickets by the end of spring the previous year, but still an awesome deal for those willing to commit early. 4 days of skiing (no blackout dates) in one of Colorado's big front range resorts for $149 (plus alot of other benefits like discounted friends tickets), what's the catch? You have to buy the tickets by the end of spring the previous year, but still an awesome deal for those willing to commit early. Epic Pass (Colorado) - A total of 4 unrestricted tickets valid at Vail, Beaver Creek, Breckenridge, Keystone, Canyons, Heavenly, Northstar, Kirkwood, and Arapahoe Basin, plus 4 FREE days at Afton Alps or Mt. Brighton. A total of 4 unrestricted tickets valid at Vail, Beaver Creek, Breckenridge, Keystone, Canyons, Heavenly, Northstar, Kirkwood, and Arapahoe Basin, plus 4 FREE days at Afton Alps or Mt. Brighton. Ski Wisconsin Pass - You can buy a coupon book good for 1 free lift at each of a number of Wisconsin ski resorts here (after Nov 1st) for around $100. You can buy a coupon book good for 1 free lift at each of a number of Wisconsin ski resorts here (after Nov 1st) for around $100. Intrawest Passport (Steamboat, Winter Park, and 4 others) - Intrawest owns a number of resorts in the US/Canada. They offer a 6 x 6 passport (up to 6 days at 6 of their resorts, including Steamboat and Winter Park in Colorado) for under $550 (kids under 12 are FREE and good reductions for multiple skiers/riders and teens as well). And NO BLACKOUT DATES. Intrawest owns a number of resorts in the US/Canada. They offer a 6 x 6 passport (up to 6 days at 6 of their resorts, including Steamboat and Winter Park in Colorado) for under $550 (kids under 12 are FREE and good reductions for multiple skiers/riders and teens as well). And NO BLACKOUT DATES. Liftopia - Deals at hundreds of ski resorts. Purchase lift tickets in advance & save. Deals at hundreds of ski resorts. Purchase lift tickets in advance & save. GetSkiTickets.com - Get Steep and Deep lift ticket deals at your favorite ski resorts. Get Steep and Deep lift ticket deals at your favorite ski resorts. AirBnB - people short-term renting their own places direct to the their guests. Huge site that does millions of rental transactions. people short-term renting their own places direct to the their guests. Huge site that does millions of rental transactions. Vacation Rentals by Owner - Vacation Rentals by Owner has over 1 million listings available. Vacation Rentals by Owner has over 1 million listings available. Skimap.org - founded in 2008, has the most ski resort trail maps on the internet. founded in 2008, has the most ski resort trail maps on the internet.